Wendt Character Lectures | Each semester brings a new Wendt Character Lecture. During this event, guest lecturers speak to the community about integrity, justice, compassion, and other topics of character. 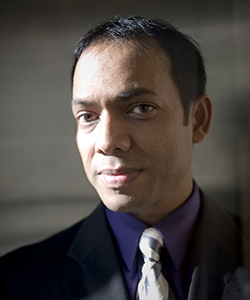 Join us at 7:00 pm on Monday, March 21, 2016 for the Spring Wendt Character Lecture on The Courage to Forgive, given by Rais Bhuiyan. A victim of a violent hate crime, Mr. Bhuiyan later fought to save his attacker's life. Bhuiyan created the World Without Hate campaign to promote healing, compassion and forgiveness. He has since received the 2011 American of the Year designation from Esquire Magazine, and the Excellence for Human Service Award from United for Change. The lecture will take place in John and Alice Butler Hall of UD's Heritage Center. It is free and open to the public, but tickets are required. For ticket information, call 563.585.SHOW. Each semester brings a new Wendt Character Lecture. During this event, guest lecturers speak to the community about integrity, justice, compassion, and other topics of character. The lecture will take place in John and Alice Butler Hall of UD's Heritage Center. It is free and open to the public, but tickets are required. For ticket information, call 563-585-SHOW.